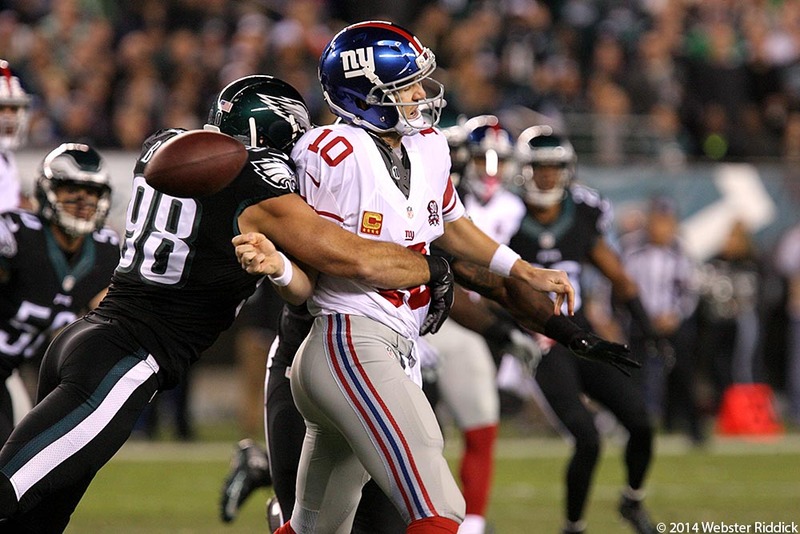 Eagles linebacker Connor Barwin Gets one of his three sacks of Eli Manning in the Birds 27-0 win over the New York Giants at Lincoln Financial Field Sunday Night. Photo by Webster Riddick. PHILADELPHIA—The New York Giants found out in their loss to the Eagles on Sunday that it’s much easier to talk trash and sell woof tickets. No matter how times you deface another team’s logo, backing it up on the field on gameday is a whole lot harder and the only thing that really matters. The Eagles, especially the defense, did all the talking in a resounding 27-0 shutout victory over the Giants at Lincoln Financial Field. Contrary to Giants defensive Jason Pierre-Paul’s contention that the Birds could easily be 0-5, the Eagles are 5-1 and tied with the Dallas Cowboys (5-1) for first place in the NFC East. New York is now 3-3. For the first time this season, there was no need for a second-half comeback nor was there a frantic run of points by the other team to make the final score closer than the game itself. Going into the bye week, the Eagles wanted to come out and play a complete game where the outcome was never in doubt. The Eagles defense dominated a hot Giants squad that came into the contest riding the wave of a three-game winning streak. Defensively, the Eagles gave Eli Manning and the Giants offense a good old-fashioned beatdown. The Birds held the Giants to just 253 yards of total offense. They sacked Manning eight times with three coming from linebacker Connor Barwin. The key to the sacks was the tight coverage of the Giants receivers by the Eagles secondary that disrupted Manning’s timing and forced him to hang onto the ball longer than he wanted. After completing 70 percent of his passes last week against the Atlanta Falcons, Manning was 13-of-23 for 151 yards and zero touchdowns. Eagles cornerback Cary Williams said the goal of the secondary was to come out and establish a physical presence against the Giants receivers to help throw of Manning’s timing and allow the front seven the chance to attack the quarterback. With the Giants best running back Rashad Jennings out with an MCL in his knee, New York could not muster a running game against the Birds defense. 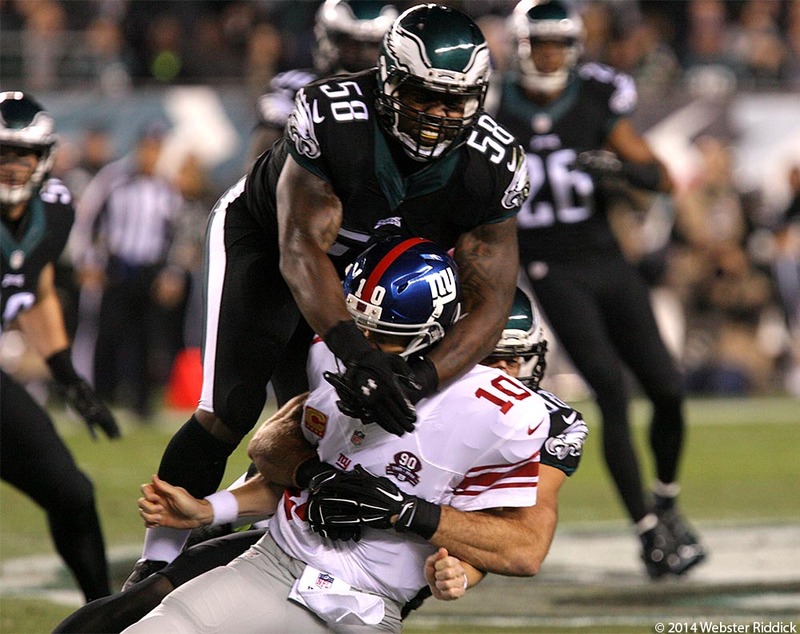 The Eagles held the Giants to just 85 yards rushing. The finest moment of the game for the Eagles defense came in the third quarter. After intercepting a Nick Foles pass deep in Eagles territory, the Giants drove the ball down to the Eagles three-yard line and decided to go for it on fourth down and came up short when Manning’s pass sailed over Victor Cruz’s head. Meanwhile, running back LeSean McCoy found his rushing mojo, gaining a-season high 149 yards rushing on 22 carries. Foles threw touchdown a pair of first- half touchdown passes to Zach Ertz and James Casey. He was 21-of-34 for 248 yards, but also threw a pair of interceptions. Kicker Cody Parkey added a couple of field goals to give the Eagles a 20-0 lead at halftime. Running back Darren Sproles scored on a 15-yard touchdown in the third quarter. He left the game with a left knee injury later in the period. The severity of the injury is yet to be determined. Cruz left the game with a torn patella on the Giants failed fourth and goal play in third quarter.